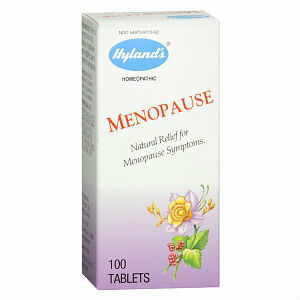 This is a homeopathic supplement that reduces occurrence of hot flashes, mood swings and irritability in menopausal women. Amyl Nitrosum: Relieves weakness, headaches, stress and flushing. Sanguinaria Canadensis: Reduces irritability and nervousness. Also curbs leg cramps and pain and vertigo. Lachesis mutus: Reduces hot flashes, nervousness, fatigue, and digestive ailments. 2-3 tablets can be kept under the tongue and allowed to dissolve every 4 hours or as required. The daily dosage amounts to 6-12 tablets a day, which is quite cumbersome. Common side effects of amyl nitrosum are headache, vertigo, flushing, nausea, shortness of breath, restlessness, drop in blood pressure and fainting. Some ingredients also have blood thinning properties so this should not be used by people taking contraindicative medication like aspirin. Overdose of this supplement can be harmful and a doctor should be consulted immediately if an overdose occurs. A pack containing 100 tablets costs retails for $9.79 but can be bought online from Vitacost for $6.69. However, since the dosage for the product is high, one bottle lasts 15 days or less and the effective monthly cost is $13.38. This price is reasonable when compared to that of other menopause supplements. The company does not offer any guarantee regarding the quality or effectiveness of the supplement. Since it is a homeopathic product, the Homeopathic Pharmacopoeia of the United Stated has approved all ingredients separately. Is Hyland’s Menopause Worth It? This is homeopathic supplement and does not have any ingredients that cause major side effects. However, it is not completely natural. If homeopathic treatments do not suit you, this is not the product for you. Jackie Horowitz	reviewed Hyland's Menopause	on October 6th	 and gave it a rating of 2.